Radio Times North West, Yorkshire & North East Get your quick news about your daily entertainment with this Radio Times North West, Yorkshire & North East. Want to know what is on the television, but don’t know where to look? Well get in quick and get all of your news and daily entertainment with Radio Times North West, Yorkshire and North East. It is the same type of Radio Times, but created for readers up in the North West, Yorkshire and North east. Radio Times brings you all the latest gossip and news from the world of television and radio, if it’s the latest gossip, news or celebrity, you can read all about in the latest issue. Featuring the latest bites about an upcoming show or what’s funny and strange that’s happening in Hollywood. Wherever your interests lie, a Radio Times magazine subscription will help you find your perfect programme on one of over 85 digital TV and radio channels every week. The simple and easy-to-understand TV listings and inspiring recommendations mean you'll have no trouble discovering those hidden gems. Plus there are exclusive interviews with the biggest names in the business for you to enjoy, behind-the-scenes specials providing fascinating insights into the nation's favourite programmes and exclusive photo shoots which you'll only see in Radio Times magazine. For the Radio Times London Editon, Click Here. For the Radio Times Scotland Editon, Click Here. For the Radio Times Wales Editon, Click Here. Like : the best magazine of its type. Dislike : programme descriptions put in the margins, far better the original when it was put with the programmes and much more information. I like this TV guide. It works well focusing on documentries and the serious side of viewing. Having been buying this magazine for at least 20 years. Still enjoy reading it and doing the puzzles. Radio Times magazine has been a permanent fixture in my house for as long as I can remember. I remember when I was little, my parents would buy this magazine each and every week, and we'd all look forward to seeing what was going to be on TV in the following week. The Christmas edition was of course the highlight of the year. 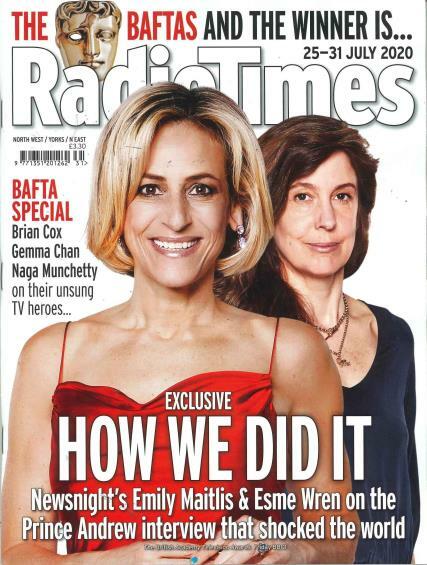 Now I'm a married woman of 43 and I still buy the Radio Times each and every week, and as when I was little the whole family looks forward to seeing waht's going to be on the telly. I'm sure that when my daughters have their own families they'll be carrying on the tradition!